Designed & Manufactured by EVS International. The new EVS represents a quantum leap forward in the processing of solder dross. Its sleek lines confirm its streamlined systems, advanced electronic controls and integrated diagnostics. Extensive feedback from the market has enabled EVS International to offer a machine that satisfies the high standards required from a modern manufacturing environment particularly with regard to reliability, ease of operation, maintenance and environmental management. Offering capacities of 5kg/11lbs (EVS 1500) 3kg/6lbs (EVS 1500LF), 10kg/20lbs (EVS 8K), 6kg/12lbs (EVS 8KLF) or up to 20kg/44lbs (EVS 10K) 12kg/24lbs (EVS 10KLF), the new EVS has (in most cases) the facility for single operation dedrossing of even the largest wave soldering machines. Its large integrated hopper makes rapid transfer of dross both simpler and safer and speeds up De-drossing time by up to 50%. Each model of EVS Solder Recovery System has a Lead and Lead Free version. EVS 1500, EVS 1500LF, EVS 8K, EVS 8KLF, EVS 10K and EVS 10KLF. The process used by the new EVS is unique to EVS International. and protected world-wide by established and pending patents. Simple in concept but revolutionary in its effect it breaks new ground in the efficient regeneration of waste in a shop floor environment. The new EVS is an enclosed automated system. Hot dross is loaded into the large hopper and sealed into the machine. The process, once started by the operator, recovers the solder into a solder tray in the form of ingots that are easily placed back into the solder pot and deposits the spent dross automatically through a chute to a covered dross bin. Air is extracted via a powerful stand alone four part filtration system, which ensures that the emitted air is usually cleaner than the surrounding workplace. A Hopper Extraction System is utilised to prevent the escape of any fumes and dust which may be generated when loading. An automatic air-knife cools the molten solder ingots until safe to handle. Premature removal of the ingot tray is prevented by a safety lock. 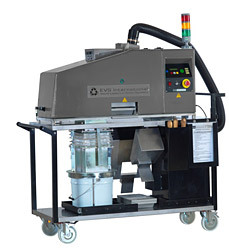 Handling and moving of dross is reduced to a minimum as it is contained within the EVS until it is automatically ejected into the dross bucket. 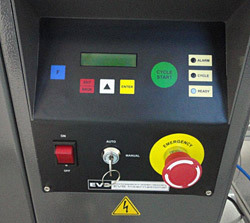 Extensive safety features are built into the machine protecting against misuse and abuse. A variety of switches and sensors are deployed and electrical and electronic circuitry is fuse protected. Maintenance is assisted by prompts from the LCD read out and facilitated by easy access to all working parts of the machine. Routine cleaning can be carried out from a comfortable standing position. The new EVS is designed for simple one person operation on the shop floor utilising existing staff. There are no complex installation procedures, just plug it in to a single phase supply and a six bar airline and it is ready to go. Once the new EVS has reached operating temperature, hot dross can be loaded and the hopper door shut. After the start button has been pushed no further operator intervention is required until the solder ingots are removed. The cycle takes six minutes plus cooling time. The new EVS is managed by an advanced microprocessor control system integrated into the cover structure. Its clearly labelled facia includes function buttons, an LCD display and LED indicator lights. Built in safety devices stop the machine if the cover is lifted, or the solder tray is not in position during operation. An emergency stop button is fitted. 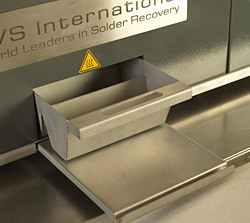 Recovered Solder is dispensed to a Solder Ingot Tray and can either be stored or reintroduced to the process. Spent dross is despatched through a sealed chute to a dross bucket which can easily be removed when full. Fumes are automatically extracted via a high efficiency stand alone filter which consists of a NEW two part filtration system - The NEW Combination Filter has been specially designed by EVS to reduce the amount of filters and filter changes needed and Activated Carbon Filter. The NEW combination filter can also be used in all older EVS models. EVS have also designed a new HS High Solids fume extraction to handle higher solids fluxes and fluxes used with Lead Free Solders. The advanced controls of the new EVS enables the user to perform comprehensive system diagnostics via its LCD readout and system of LEDs - without recourse to external equipment. Routine maintenance is indicated by messages showing 'Interim Service' and 'Full Service'. Operating faults are indicated by a short description on the LCD readout. The Auto/Manual key switch enables the machine to be put into 'Manual' mode for maintenance purposes. A comprehensive operating and maintenance manual is supplied with the machine and training and support is provided by the manufacturer or local distributor. Fail safe safety switches fitted as standard together with emergency stop, automatic over temperature cut out, fully protected circuitries, CE approved, also complies with current machinery directives. (Please see technical page for more details). The EVS has a 1 year warranty or 2000 cycles whichever is soonest. Our Machines provide fast, simple and cost effective on site recovery of purified solder from waste wave solder dross and fully lead free compatible now. The Solder Recovery technology built into the new range of EVS machines is based upon world-wide patents not just for the machines but also for the underlying process, allowing EVS International to develop a range of new machines covering all aspects of solder recovery. The new EVS Solder Recovery Systems are simple to use, ISO14001 compatible, improve process and quality and provide rapid payback. EVS International operates a dedicated support service to the electronics industry. In addition to supplying a wide range of products used in the manufacture of electronic products, EVS International also develops and manufactures environmentally friendly and innovative solutions to production problems. EVS International works closely with its customers so that a complete understanding of manufacturing requirements results in a support service, tailored to shop floor requirements. This has led to new EVS International innovative product designs such as the Solder Recovery System. For further information or to book a free no-obligation demonstration of any EVS products please contact us.